About 17 years ago, Lawrence Kennedy introduced me to some video tapes of Stanley Meyer and Roger Billings who were working on water fuel technologies. Lawrence knew both of them because he used to tour on the same lecture circuits. Some of the videos of Stan Meyer were never seen online for many years after that, but like most people, I was sucked into the whole story about the dielectric separation of water molecules, which means electrostically splitting water without conventional electrolysis. It made perfect sense and I had suggested some small scale experiments using scaled up versions of John Bedini’s radiant oscillators that output high voltage spikes, which normally charge batteries. The tests were successful as far as proving the point, but have to be taken to another level to be practical. The following image is an example of the output of an oscillator that I built back in about 2000 before most people ever heard of self-oscillating versions of Bedini’s SG circuits. 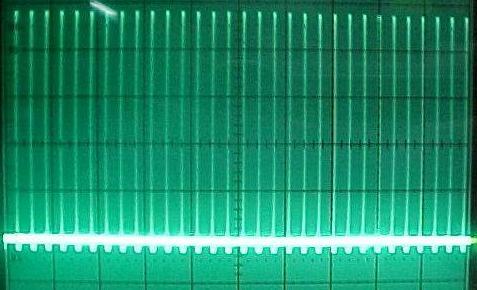 That scope shot is upside down because the high voltage spikes are actually negative. It only takes a small search to find that most of the Stan Meyer research online is obsessed with his VIC (voltage intensifier circuits) and resonance in order to create abnormally high amounts of commonly-ducted water gas (HHO). The problem is, this has absolutely nothing to do with what Stan Meyer was originally doing. 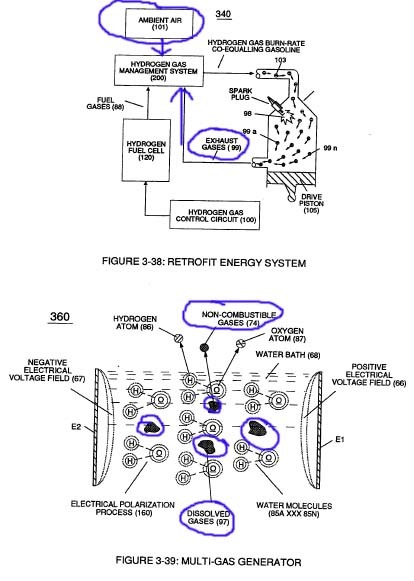 None of the high voltage water splitting methods were around until much later in his research and its an indisputable fact documented by his own patents and other paperwork. The other problem is that when this fact is brought up to all the self-proclaimed Stan Meyer experts, they go ballistic, literally. I believed in this too, but was always open to learning whatever I could that was contrary to my current beliefs – and being teachable is what allowed the right teachers and answers to appear at the right time. Years ago in Energetic Forum, there were many discussions about Stan Meyer and water fuel in general as well as a handful of people claiming to have figured it all out. But these people who “figured it all out” have one thing in common – they all have a 100% success rate in failing to show anything significant. This is not to say that someone can’t have something valuable to contribute, but when they go out of their way to slander, defame and threaten others just because something is proposed that is contrary to what they are extremely attached to, it gets a bit ugly. One of these people even threatened my life after I revealed his identify – that is Ed Mitchell. Here is an example of a video that is claimed to be an amazing amount of HHO production with the VIC type circuits posted by someone that has posted countless misleading claims over the years about what Stan Meyer did. You can fast forward to 1:10 and in a few seconds, you can hear the production is “very, very fast”. This is Ed Mitchell’s nonsense. Now, here is a single tube test I did years ago producing more gas than all those tubes above combined using nothing more than a variac with full rectified AC to DC and the ground line has a coil of wire used for current restriction. The tubes are conditioned, which I’ll mention in a moment. Forward to 0:30 seconds to see it kick on. That is only one of of multiple tubes connected. As the video says, Meyer didn’t really claim to condition his tubes, but he did post that he was wanting to insulate them with Delrin and other methods to prevent current. In any case, I did find that I was able to get a lot of gas production from a little input but this isn’t even the main point to this post. This is posted simply to maintain the accuracy of the history and to show that Ravi did not learn it from Dave Lawton as is often claimed by others. Now, in Energetic Forum, Michael J.N. and Tutanka were mentioning the importance of nitrogen and I was completely open to learning what they wanted to share. Michael had built a jet engine that runs on water about 25-30 years ago at this point during at time that Stan Meyer was traveling to the UK. He knew Stan Meyer and Stan admitted to him that his exhaust smelled like ammonia. I have personally met a good handful of people that personally worked and met with Meyer and they all concur that Meyer’s exhaust did indeed smell like ammonia and nitrogen was indeed important to the process of creating a synthetic gas on demand. 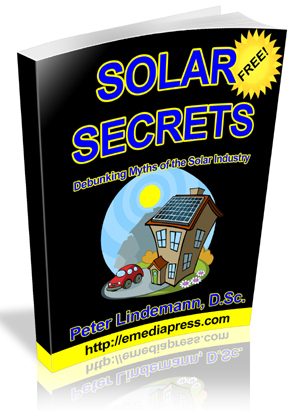 Meyer did mention that he used “non-combustible gas” to slow down the burn rate of the hydrogen gas in his process so that he can get it to burn more like gasoline. If you have experimented with hydrogen gas, you know it detonates and does not combust so you cannot get the real thermal energy out of it. The Meyer “experts” spreading disinformation online will tell you that nitrogen is not the non-combustible gas, especially Ed Mitchell – he expressed violent opposition to it as evidenced by all his posts in Energetic Forum including threatening my life as I mentioned. I already knew about the non-combustible gas reference and it was a member named “Rock” who brought it to my attention that Nitrogen was actually spelled out in Meyer’s earlier work so it wasn’t speculation. You can see in Meyer’s earlier work he spelled out Nitrogen and later in his work, he removed the word Nitrogen and only referred to it as a “non-combustible gas”. Many people applaud hydrogen cars for having water as an exhaust, but that is only showing you evidence that they destroyed almost all of the thermal energy they could have received from the hydrogen had they PREVENTED the formation of the water molecule. That is the key to the Stan Meyer technology. When you dilute the water gas with nitrogen, the ignited hydrogen will bind to nitrogen and create NH3 (ammonia) and that prevents the formation of the water molecule. It also allows the hydrogen to burn slower so that it is more like a slower gasoline combustion instead of a fast hydrogen detonation. Where did Meyer get the idea about controlling the hydrogen burn rate? We’ll get to that later because it is very important – speculation, but when you see it, it may appear overly obvious. Believe it or not, Ed Mitchell and other self-appointed experts boldly claim that Nitrogen has no part of the Meyer process. Yes, Meyer did talk about dissolved trace gases and nitrogen. Meyer claimed water had 17% nitrogen, but it is much less. You will see in a bit that Meyer also states that for REALISTIC and PRACTICAL application of the principles that the ambient air is literally from the air because the real amount of usable nitrogen dissolved in the water is UN-REALISTIC & UN-PRACTICAL. Some of those gases are dissolved in water in quantities much less than what Meyer claimed, but the point is that the ambient air with the NITROGEN used to dilute the water gas to slow its burn rate down was literally from the air. Not only can it not be ignored as the misinformation agents will have you believe, it is the KEY to Meyer’s creation of a synthetic water fuel. Look at the top part of the image, the AMBIENT AIR coming into the system that has the NITROGEN literally comes from the ambient air, which is from the air intake and is common sense and obvious that it is not dissolved gases in water! While Ed Mitchell and others spreading disinformation tell you to ignore nitrogen altogether, it is the VERY key to Stan Meyer’s synthetics fuel on demand. 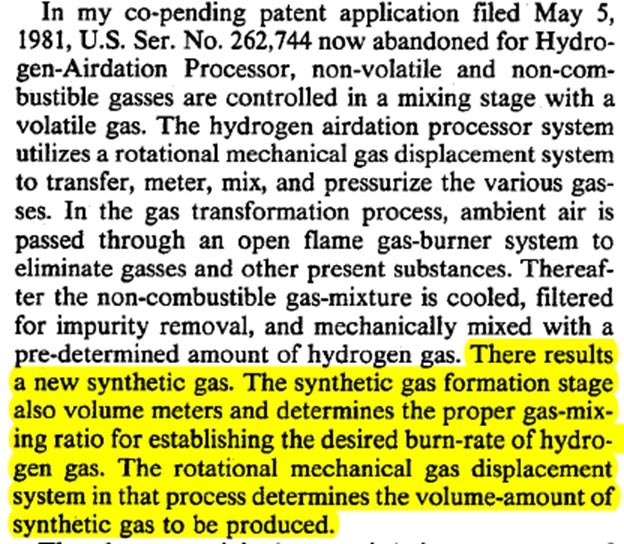 Meyer even uses the term synthetic gas even though the self-appointed “experts” continue to deny this fact. “There’s nothing to see here folks – move along!” – that is the method of operation (M.O.) of the disinformation agents who are spreading lies, rumors and myths online doing their best to not let you see what Meyer was saying in his own words. They’re all Meyer experts but they deny the most important things that Meyer said in his own documents. They jump into the middle of Stan Meyer’s work bypassing everything he did in the beginning and they call that scientific?! You can see the constant attempts by Ed Mitchell and others in his circle are constantly trying to do what they can to deter you from learning about the Nitrogen key, but here you are with Meyer’s own words and these are just a few of MANY snippets from his documents. In Meyer’s documents, he defies what he means by non-combustible gases. 1. Nitrogen dissolved in water, which he says is not practical or realistic to use because the amount is too small. 2. Nitrogen from the ambient air, which is 78% of the contents. Here is a direct excerpt from Meyer’s documents showing you that he was creating a SYNTHETIC GAS and water gas by itself is NOT a synthetic gas. Creating ammonia type fuel by modifying water gas with nitrogen from the air IS a synthetic gas. What you see at the top left is a mixing valve to let in ambient air from the ATMOSPHERE and NOT ambient air gasses dissolved in water as Ed Mitchell claims. The FIRST blue highlighted section shows that dissolved nitrogen in water will indeed mix with the freed up hydrogen and oxygen. Meyer is wrong about water containing 17% nitrogen though, it is much less. The SECOND blue highlighted section shows that Meyer is stating that the nitrogen controls the burn rate of hydrogen. The THIRD blue highlighted section shows a REALISTIC AND PRACTICAL manner of really controlling the burn rate of hydrogen is by directly mixing the water gases with ambient air from the atmosphere. 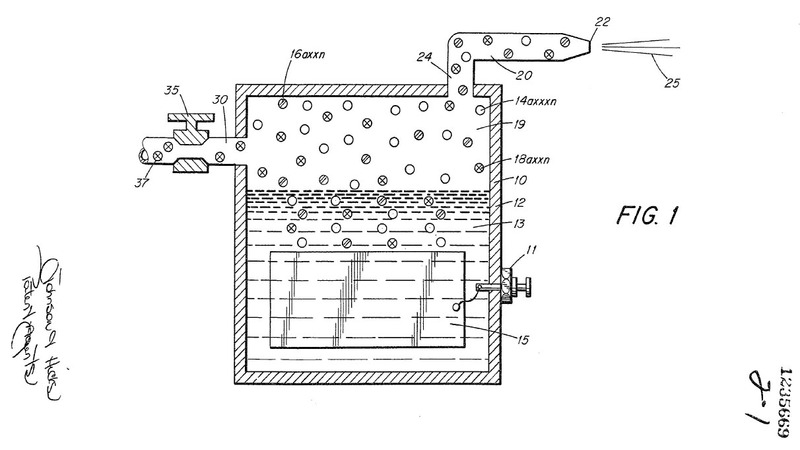 In this old original patent, he did it by letting air come into the top of the cell, which is certainly NOT traces of nitrogen dissolved in water as the online disinformation is trying to make everyone believe. Now, just because Meyer started out diluting water gas with Nitrogen, this does not mean that trying to create high amounts of HHO is a bad idea. This was before Meyer ever went the route of the VIC to try to produce more water gas for the same electricity. You can see the patent doesn’t even use concentric tubes in his cell but flat plates and he has even earlier patents where the electrodes are simply 2 pointed rods with a gap between them submerged in water. Most people are starting their studies with Meyer’s technology with concentric tubes and the VIC completely throwing out the window what the whole point was – to control the burn rate of hydrogen to get the thermal energy out of it so it burns like gasoline (slow) instead of a fast detonation. I’ve created water gas hundreds of percent beyond Faraday and it is still not enough to run an engine and that was never what Meyer did. It wasn’t about QUANTITY of gas, it was about QUALITY of gas. He also recycled the exhaust back to the intake to condense and build up that supply of ammonia to act as the source of hydrogen. There is no magic here and no natural principles are violated. As long as you can crack hydrogen from the ammonia and there are many tractors, etc. running on ammonia just fine, then you can continue to use the exhaust as a supplemental fuel source that condenses over time. If you do want to get more details on this entire process, you can get my Water Fuel Secrets package here: http://waterfuelsecrets.com but honestly, there are enough priceless bit of information above that if you just searched it long enough, you’ll find all the references to see that what I am saying is 100% accurate as far as my claim that this is exactly what Meyer is spelling out in his patents and Nitrogen dilution of the water gas absolutely is indisputably THE KEY to his synthetic fuel on demand that allowed the water gas to burn like gasoline instead of detonating like normal. I hope you enjoy and appreciate the information shared above. There is more truth about what Meyer did posted above than in most websites on Meyer’s technology combined. I’m not trying to compete with anyone, I just have no tolerance to misinformation when the truth is right there in front of everyone in readily available public domain documents! This is not some discovery unique to me and I have to give credit to those who helped point me in the right direction. Recently, I have been in touch with someone that has an interest in this water fuel concept and my plasma ignition and during some discussions, he pointed out some very interesting items from someone’s work that goes back before Stan Meyer was born. He’s getting it all prepared and when I announce it, I will make another blog post here pointing out a few things about that work and why I think it is an absolutely priceless study. When this person pointed out some of this old work, it looked fairly obviously to me that Meyer had studied the same work and that is where he got the ideas about controlling the burn rate, recycling his exhaust and Meyer even mentions in his documents that he could close loop his whole system. It appears to be THE GENESIS of all of Meyer’s work in regards to controlling the burn rate of hydrogen, etc. as it looks like a natural extension of the work of one particular historical individual who is surrounded with mystery, tales and it wouldn’t be complete without a bit of conspiracy! The good thing is, that person’s original work still survives and some people have working models and I’m looking forward to announcing this soon. The implications of being able to really put this technology on the map is huge. Not enough people know about it but soon, my hope is that you will join me in spreading the word about it far and wide! PLEASE USE THE SHARE BUTTONS BELOW TO SHARE THIS ON FACEBOOK, TWITTER, ETC.